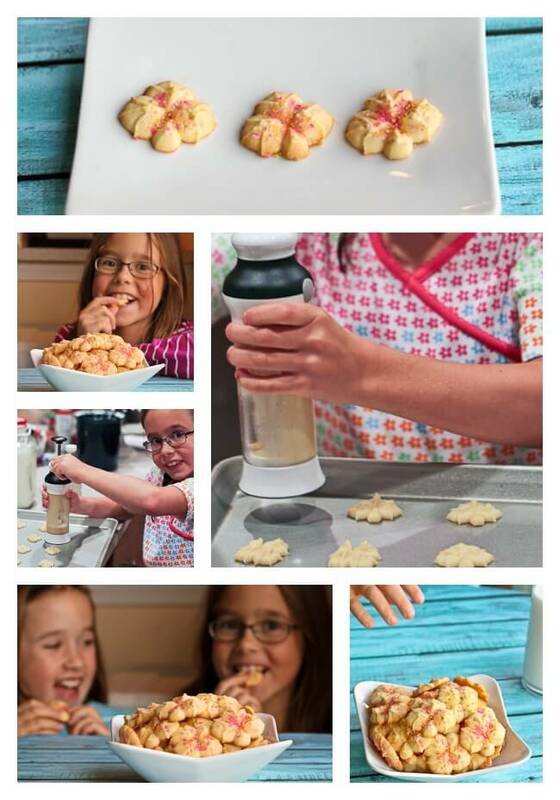 Piped Vanilla Spritz Cookies are easy, fun and delicious; the OXO Cookie Press, which I received for the purposes of a review and to help promote #CookiesForKidsCancer, is simple to work and comes with loads of fun shapes to press out. Affiliate links have been used to like to items I am discussing in this post. 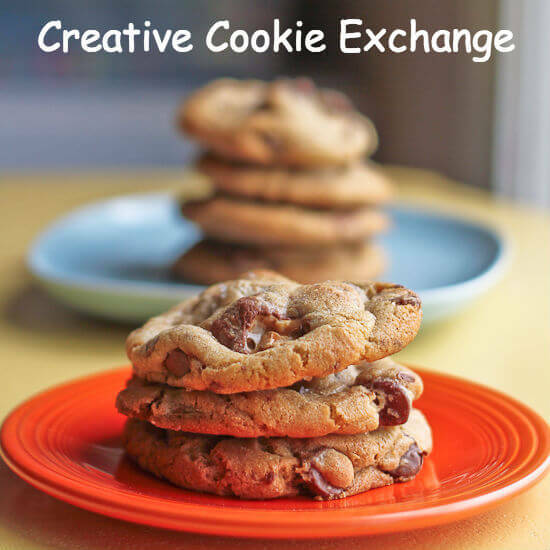 I am so sorry I took so long getting this post out–hopefully if you have seen the green, circular “Bake A Difference” sticker on OXO products you have realized that a portion of the proceeds from purchasing those products will go to Cookies For Kids Cancer. To back up a bit, OXO sent me their amazing cookie press so I could bake up some cookies for Cookies for Kids Cancer. This has become a beloved September ritual for me! Cookies for Kids’ Cancer is an organization I have been supporting since I first became aware of it. You can read more about my discovering them and what they do here, but basically I became aware of them through OXO, as OXO is one of their big supporters and I work with OXO Blogger Outreach. Anyway, September is National Childhood Cancer Awareness Month, and one of the purposes of this post is to also make you aware that you can support Cookies for Kids Cancer this month by purchasing certain “Bake A Difference” products at OXO. A second purpose is of course to just raise awareness for Cookies for Kids Cancer and the work they do. So are you ready for the embarrassing truth about why I am late getting this post to you? I had never used a cookie press before, and it made me a little nervous. Now of course I realize how incredibly silly I was. This was so easy!! Alex and I had so much fun doing it also. The cookie press came with a wonderful assortment of discs; Alex chose the maple leaf design because it was fall. As you can see in the collage above, it was easy enough for a child to operate also–something I love about most OXO tools. Preheat oven to 350 F. You will be using UNgreased cookie sheets for this recipe, so just have some cookie sheets ready. Beat the butter on medium low until it is creamy. Add the milk. Continue beating on medium low until incorporated and looser still. 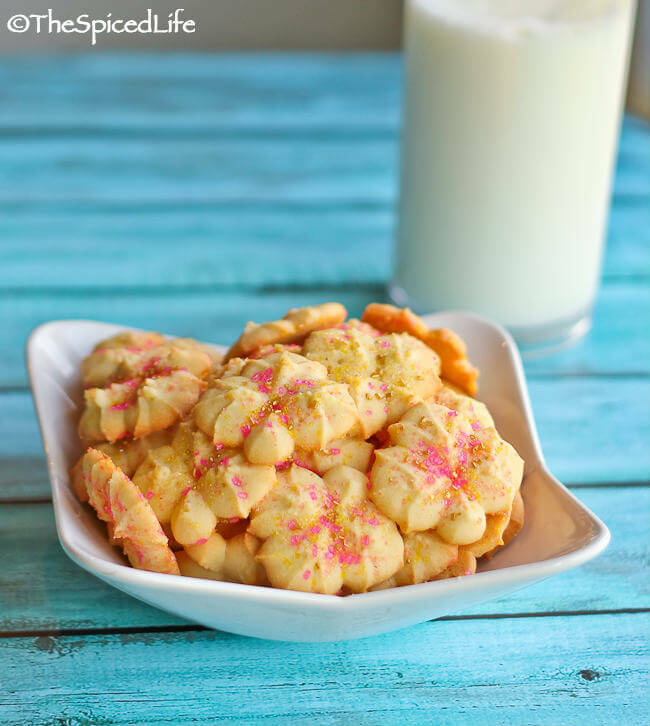 Add the sugar and mix until incorporated–you do not want to incorporate a lot of air into these cookies, so keep everything around medium low or lower. Because of that, the mixing process for these cookies takes a bit longer–be patient. Once the sugar has dissolved, mix in the vanilla. Beat in the egg yolks and salt until incorporated. Gradually stir in the flour: you are aiming for a dough that is not super soft, but also not too stiff to push through the cookie press. If the dough seems too stiff–it has been dry here and mine did–add more milk, ½ tablespoon at a time. Mine took an extra 1 tablespoon total. Fill the tube of your cookie press (you can also use a plastic bag, but after discovering how easy it was with the cookie press I will not be looking back! ), and press the cookies out onto the ungreased cookie sheets, about 1½ inches apart. 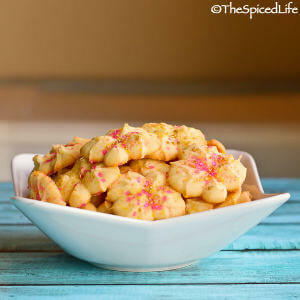 Sprinkle with sparkling sugar if using. Bake for 12-16 minutes, until lightly browning at the edges. Rotate sheets if necessary for even browning. Let cool on sheets for 5 minutes before moving to a cooling rack. Affiliate links were used in this post, but only to link to items I would be discussing and linking to in any case. The OXO Cookie Press was sent to me by OXO for purposes of an honest review and to raise awareness for Cookies for Kids Cancer. No other compensation was provided, and all opinions are my own. 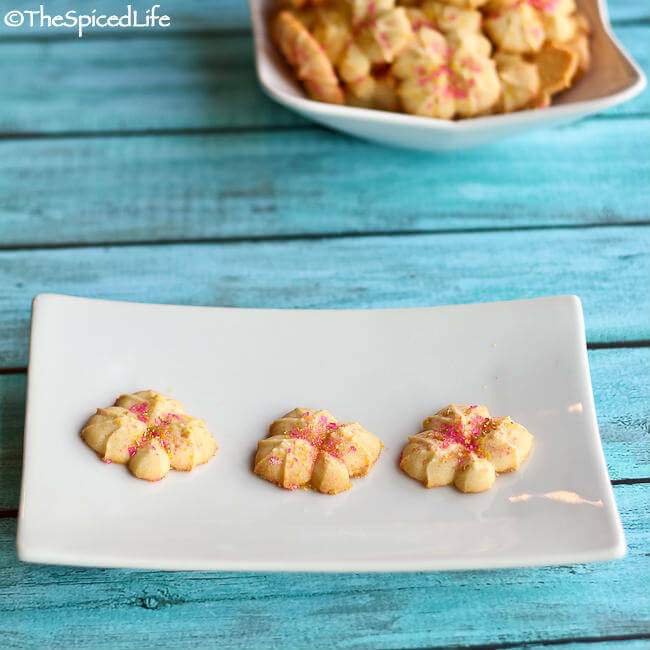 I’ve always heard terrible things about cookie spritz presses in general but I’ve also heard that the OXO one is AMAZING and totally foolproof! No surprise there. Your cookies are so cute! I haven’t had spritz cookies in YEARS! I used to love to make these as a kid – and honestly? I still have that cookie gun from back then! What a wonderful cause! And I love your cookies! I have never used a cookie press before, but now I want one after seeing these!